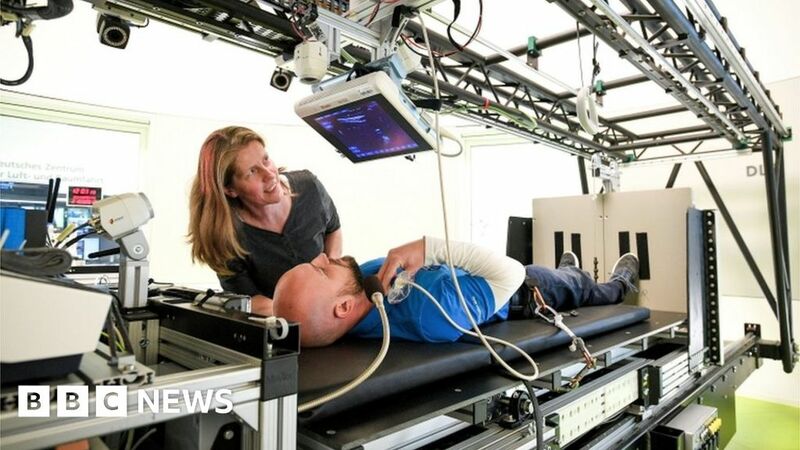 A machine which simulates the effects of gravity could reduce muscle wastage for patients in hospitals as well as astronauts on long missions. Tests will explore what happens when volunteers are spun daily on a human centrifuge after 60 days of bed rest. It is hoped the technique will speed up patient recovery and lessen the impact on future space flights. The research in Manchester and Newcastle is backed by the UK Space Agency. “One day, astronauts might have a daily quick spin in a centrifuge on the ISS [International Space Station] rather than spend hours on gym equipment in space. The research is backed by the UK Space Agency with £500,000 awarded to Northumbria University and Manchester Metropolitan University. Twelve men and twelve women volunteers will be subjected to 60 days of bed rest, simulating the long-term effects of weightlessness. Some of the group will spend 30 minutes every day lying flat in the human centrifuge as it spins and researchers will examine muscle degeneration.